Fixie Farr believes in her father's motto: Family First. She is determined to honor his legacy but is thrown off when a handsome stranger steps into the coffee shop, asking her to watch his laptop for just a moment. In mere minutes, she saves his laptop from being destroyed in a freak accident. He scribbles an IOU with his business card. She never thought to claim an IOU from a stranger but finds herself in a new series of IOUs for everything from small favors to life-changing acts.Until she is torn between her family, which should come first, and the life she really wants. Let me preface this review with a disclosure. I am a fan of Sophie Kinsella. I will read any book with her name on the cover. Call it reader's loyalty. But I am very, very disappointed with this new release. The only thing that kept me reading until the end was my fierce loyalty to her as an author I love. To be quite honest, I was over it from the first paragraph when the main character introduced her nickname as "Fixie." Serious eye roll. Then about 40% into the advance reader's copy, I questioned whether it was worth finishing. At that point, I was bored with the storyline. Yet I continued because...well, Sophie Kinsella. Finally at 93%, I was beyond done yet glad I reached the end. I suspect that Kinsella fans will have the same reaction as I did reading I Owe You One. For readers new to this author, please do not start with this book. It may turn you off from her earlier greater books. Nevertheless, judge for yourself. And to the author...you owe me a bestseller. I KNOW you are capable of better writing than this. 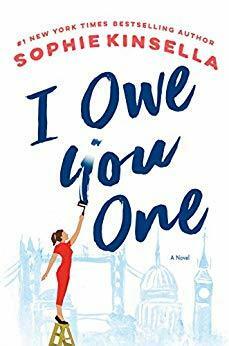 Happy Early Pub Day, Sophie Kinsella. I Owe You One will be available Tuesday, February 19.